It has recently come to light that CNET’s Download.com Installer includes a bunch of crapware. But it doesn’t end there, here’s my experience downloading a program, and it’s ugly. After reading Austin’s article on CNET’s Download.com joining the dark side, I had to check it out myself. I can honestly say he is completely correct. I attempted to download a different program from the site, one that didn’t require the CNET Installer, and it came bundled with a lot of crapware too. In his article, Austin points out that the Download.com installer, wraps a bunch of crapware in it when trying to install certain programs. But it doesn’t end with just that. 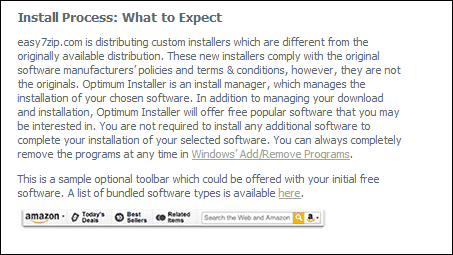 CNET allows individual installers with bundled crapware through too. Note: In this article I’m throwing around terms like adware, crapware, spyware, junkware…etc. While each term has an “official” definition, let’s not argue semantics. In the end, it’s all the same, extra junk on your computer that you don’t want, and is detrimental to your system and your privacy. I didn’t go as far as allow my system to get infected like Austin did…cheer’s to him for going all the way so you don’t have to! But I’ll give you a synopsis of my experience of getting hassled to download laughable crap. 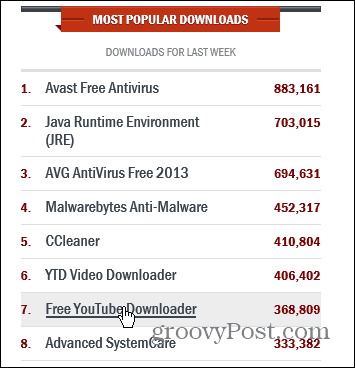 I started my test by picking a programs from the “Most Popular Downloads” list: Free YouTube Downloader. When I got to the download page, I noticed this CNET Editor’s note letting me know something suspicious was about to happen. I proceeded to click the “CNET Secure Download Now” button – but I never did get CNET’s installer or “download manager” — whatever they call it. When the installer started, I was presented with the “Recommended” method. The Recommended method, of course, would include a Delta Toolbar to make my browsing and searching the internet faster and easier! Oh, and it would also hijack my default search engine, home page, and new tab page…um no thanks! Well, let’s see what the Advanced install presented me with. Surely something easy to just install the app right? Not quite. First, I had to make sure an uncheck all options of the Delta crapware. Another important thing to point out here, is you have to uncheck each item from the bottom up. 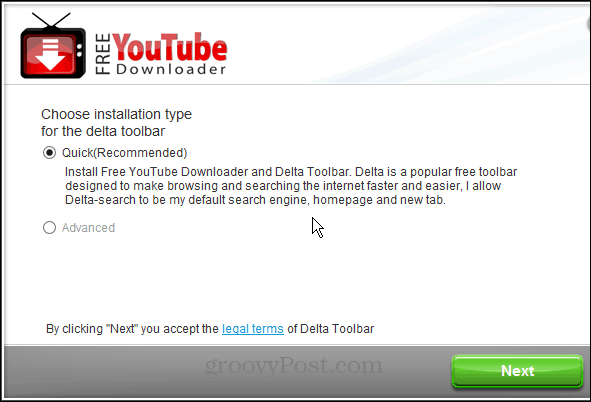 If you just uncheck the first box ‘Install Delta Toolbar” does NOT uncheck the other hijack items. 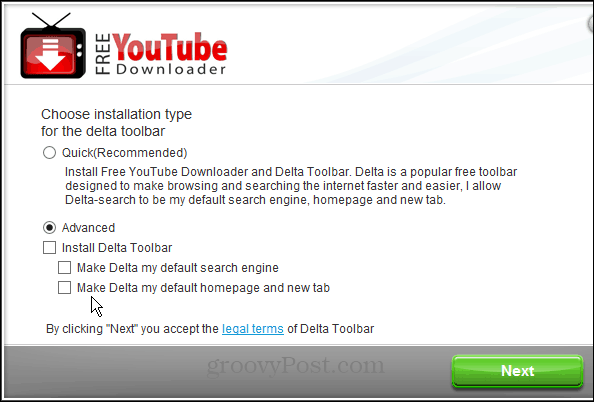 When installed, it will modify the user’s home page and search settings to redirect to delta-search.com. It also sends various configuration information to its remote servers and tracks your browsing habits and uses such as URLs visited and such in order for the toolbar to provide advertising. It didn’t stop there. 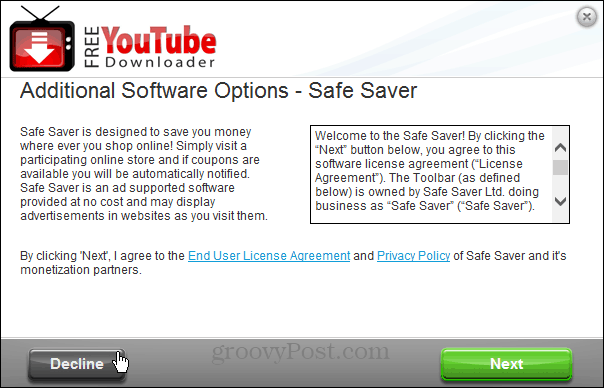 Here’s another offer for Safe Saver – another toolbar, search engine and homepage hijack…sigh…Decline. If you’re interested, you can check out the Safe Saver EULA and will quickly discover it will do the same thing the Delta Toolbar does. Seriously? You’re going to nail me with a third chance to install you’re wonderful crapware? I can’t help but laugh at the fact this “snake-oil” called RegClean Pro claims to increase my computer speed up to 300%!!!! That’s amazing! Almost as amazing as the One Simple Trick we Found on April 1st this year to Fix EVERY Computer Problem Ever! After the third decline, it started installing “something” but I quickly aborted it before anything could finish. Enough with this already…Hey CNET, 2002 called and it wants its Spyware and Adware back! Well, I guess the company does need to pay for the cost of hosting the files on a server that millions of people download from every day. Oh wait, they have ads for that, and the parent company is CBS Broadcasting, Inc. How much did advertisers pay last year for a 30 second commercial spot during the super bowl? This statement, enters a murky and shady gray area. I guess, the statement is true that the program file itself is Spyware free, however, the way CNET allows these installers through with tons of malicious crap means it’s NOT crapware free – far from it. Unfortunately bundling this junkware is an industry wide practice. The public doesn’t seem to want to pay a fair price for a piece of software, so developers, if they want to make money, need to bundle in this adware crap into their installers. You’ll find similar practices on other download sites such as Softpedia, Filehippo, and others. Even if download sites don’t have a specific malware infested installer, they the sites have “Download Here”, “Start Download” type buttons all over, making it extremely confusing for less experienced users to get what they want, and not a bunch of other crap that they don’t. This is why we always recommend to either download your software directly from the developer (even though there you can experience the same bundled crap) — or install from Ninite.com — this service automatically opts you out of any toolbars or other crap an installer tries to sneak on. And always pay attention to what you’re installing folks. Don’t just blindly click Next > Next > Agree >Install. To be clear, neither groovyPost or myself has an issue with the writers, or CNET in general. In fact I enjoy several articles from respected journalist who work at the site and other properties of CBS broadcasting, Inc. However, this practice of wrapping pure crapware in its installer package, and allowing developers to bundle spyware and other malware in their software installers, is a horrible practice for it’s readers. Especially since the company claims everything on Download.com is malware free. Note: I reached out to CNET to get a response as to why it includes crapware on its Download.com page, and am awaiting a response. When and if they do reply, I will certainly include it here. We sincerely apologize for the inconvenience here, and we have shared your feedback with the appropriate site managers. You do have a couple of options to download without using the CNET Download.com Installer – you can either click the Direct Download Link for Installer Enabled items, or, if you have a CNET account, completely disable the Installer for the whole site. Well, first of all, I have gone through and looked at several different programs offered on Download.com, and most of them simply don’t have the “Direct Download Link” just the big green button — which has crapware, as Austin pointed out in his article. Second, even if you do see the direct link, if the developer has their program wrapped in a crapware installer, you still have to deal with it. Now, I have not created a CNET account, and found an option to disable the installer for the whole site. That is next on my list we continue to investigate. Colleague here got hit by snap.do, one of the most difficult browser hijacker to get rid of. We had to go into the Registry to finally remove it. Very annoying indeed! Many updates to Java in recent months has led to us removing the Ask.com toolbar multiple times for fellow colleagues, they didn’t see the pre-ticked download box in the smaller print. @SueJ: Yeah, Java is another bad one. I think Java also treis to sneak in McAfee too? Or sometimes the Google Search bar. Very annoying. Haven’t seen McAfee, or Google search bar with Java downloads. Luckily ask.com toobar was easy to uninstall. Ah, I am probably thinking of Adobe Flash — with so much crapware out there it’s hard to keep it all straight! LOL. So if my computer is full of this stuff what is the best way to delete it all? @Bets72: To be honest, the best way — depending on how much junk is on your system — is to reformat your drive and clean install Windows. Also, you might want to run programs like Malwarebyte’s, CCleaner, and SuperAntiSpyware. CNET used to be my “go to site” to download software. I did happen to catch it also trying to install some ‘crap’ that I didn’t want and was paying enough attention to stop it. I am VERY disappointed that this used-to-be-wonderful download site fell to this status. WHAT AN EYE OPENER !!!! In the future, I will never hit Next > Next > Agree >Install again. Your welcome! Yes, hitting the “next, next” thing is all too common. And no one reads the EULA or license agreements for software they install. We all need to be diligent in making the right choices with this type of stuff, and let companies who practice this behavior know we’re not happy with it! This probably explains why my computer is always full of crap software I never installed And why it’s so slow!! I usually look for any rubbish that may be ready to accompany the download. However, to make sure that nothing has sneaked on to my system, I go to the control panel and check the “Programs and Features” section. I quickly check for today’s date (the day only) and if I find anything I check the full date. If the full date matches today’s date I know I’ve got a stowaway and evict it. I got nailed at CNET today while downloading a simple amortization schedule excel sheet. Unloaded a ton of crapware on my machine, including WebCake, Conduit, and Mixi.dj toolbars. It took about 3 hours to get it all off and included me having to modify my registry. I mean, I knew CNET was garbage, but that’s ridiculous! Software that diverts or modifies end users’ default browsers, search-engine home pages, providers, security, or privacy-protection settings. It’s funny, I just installed Youtube Downloader yesterday at the recommendation of Sharon Vaknin in one of her articles on CNET. I used the program once. It worked well. And installed all sorts of crapware. They are nice enough to include uninstallers. Except that they didn’t work. So not only are they giving us infected programs, they’re promoting them as well. Well technically….. the Title Sharon used does say ….. and MORE. So obviously she must be referring to Malware. @Brian: hahaha! Wow. You know, another interesting thing is CNET runs a lot of stories about NSA tracking and privacy — yet their download.com site is full of spying stuff. Albeit not as bad as the NSA PRISM tracking, but still. But yes, that is a hilarious story! I created an account and tried to disable the installer, but the “Update my Download.com Preferences” link just links back to the main Profile page. There is no option to disable the installer. Thanks for this info Randy! So, CNET is misleading (generous term) by saying you can disable the install manager if you sign up for an account huh? Anyone else have an account and experience the same results as this? I have been around the computer block since the 80’s. At the time I found it quite easy to be impatient when it came to, say, formatting harddrive. “Do you want to format C”, yes, “Are you sure?” YES! “Are you awfully d@mned sure?” YES ALREADY!! Eventually you hit automatically without thinking about why they are being asked. Lightspeed to today, In our quest for getting what we want yesterday, we click “…already!” and then find we have all this stuff that we didn’t know where it came from. The lesson is, be observant when installing software. Know what you want to install before downloading it and take your time, as you know the computer probably will….Be sure to read the prompts. If you aren’t sure about a program, write it down, say no and move on. After it downloads, you can research the “it sounds like it might be interesting” program/app for possible download/install later. CNET/ Download.com is being neither “fair and/or honest” Two really devious and downright DISHONEST examples are listed. 1. You click “Decline” or “No do not install” the crap ware. CNET/Download.com ignores your request and installs even though you explicitly said NO. 2. You run the CNET/Download.com uninstaller, thinking/trusting it works like the name says and all other installers. WRONG, only some files that you can see in the directory (and that do not make a difference) are removed. The crapware and other files that track you and slow down your computer are left in place. For all we know, additional hidden crapware/ tracker files might also be installed; running the uninstall had give CNET/Download.com access to your computer. (Note – some uninstallers do leave behind empty folders that have to be removed, but they are not harmful). 3 All though not mentioned in the article and follow up, just selecting or clicking o DOWNLOAD button on a CNET/Download.com site started installing crapware on my computer. This was even before the next screen appeared giving me the choice to accept or decline the crapware. My realtime AV & maleware program immediately blocked two attempts to install known maleware (crapware). So, CNET/Download.com is truly not to be trusted and has joined the DARK SIDE. Leave CNET/Download.com alone and if enough people do they might get the message. @Krazykat: Looks like you’ve done a lot of research on this as well. Thanks for all of your excellent points in our discussion here! Thanks again for your due diligence on this subject — if you’d like to do a guest post addressing your frustration on it all, and including the research you’ve shared — shoot me an email we’d love to feature your thoughts in a nicely laid out article — as not everyone reads comments. If you read Austin’s article, that was linked to in the first sentence of this article, and referred to within this article, you would see that simply declining all the crapware offers DOES NOT prevent you from getting the exact crapware you think you’re opting out of. It happened to me, and I spent hours cleaning up the mess it left behind. It would do you good (and everyone else) to read it & look carefully at the screen shots. The “lesson” you mention is old news now. The scumbags have a workaround. I wonder if some ambulance chasing lawyer would sue the daylights out of CNET for their practice of violating their own TOS rules and causing real damage, which could be easily proved to any jury? I say sue ’em! Yes, there has been complaints about how unethical download.com from CNET is for years, but now it’s reached such a sickening state, we want to do our best to let those who aren’t aware of it to know the risks. Then I wanted to just confirm it, try to add more details on it, and included a reply from their customer serve — which is obviously a canned response, as well as totally inaccurate. Bottom line: CNET/Download.com words and statements CAN IN NO WAY BE TRUSTED. THEY ARE DISHONEST, UNSCROUPULOUS, LIARS. Download.com is also devious designed to take advantage of users. Re: Do NOT Use CNet / Download.com – Spyware ! 1. The Download.com Installer does not include any spyware or malware, nor do any of the offers included in the Download.com Installer. The Download.com Installer is optional and does not install anything to your computer, nor leave behind any components when deleted. We have worked with security publishers to ensure that the Download.com Installer conforms with the necessary standards of security. There are a very few products that identify the Download.com Installer as malware; we believe those results are false-positive detections, and we are working hard to correct those problems by providing access to the Installer to security publishers and tweaking it as necessary to meet their guidelines. 2. The Download.com staff vets every offer included in the Download.com Installer to make sure that they all meet our standards of acceptability. We have reacted quickly to negative comments about offers from our users, and we will continue to do so. Additionally, we are actively working with our network of software publishers so that we can continue to add new, quality offers to the Installer flow. 3. The Download.com Installer is designed to make installing software easier for our users, and to grow our business so that we may continue to invest in new, more efficient means of distributing software around the world. Research and user feedback indicates that many people who download software don’t or can’t install it. One consistent installer logo for all software from Download.com allows users to easily find and launch the software that they have downloaded. The Download.com logo and installer also demonstrate that the software has been fully tested and found secure. Thank you for the feedback thus far. We are very interested in what our users and developers have to say, and we look forward to hearing more as we iterate on this new feature. The “installer” doesn’t INSTALL anything? It’s “optional” but you can’t get the program you want without running it? What kind of new level of corporate nonsense is this? I’m sure you’re aware that the terms spyware and adware long ago became inexorably intertwined (security professionals see little or no difference). CNet’s installer’s reason for existence is to deliver adware, and thus the installer itself is reasonably called Spyware. Nearly every program CNET offered (or has ever offered) for download ALREADY INCLUDED its own installer. You are fooling absolutely no one. There is absolutely no VALID reason to do what you’ve done, other than your apparent desire to destroy your spam. But thanks for stopping by and trying to stem the bad press resulting from your hostile actions against your previous user base. I expect your recent download stats are reflective of your new spyware status? B wrote:I’m sure you’re aware that the terms spyware and adware long ago became inexorably intertwined (security professionals see little or no difference). CNet’s installer’s reason for existence is to deliver adware, and thus the installer itself is reasonably called Spyware. True, but from my time at Lavasoft I can tell you that tagging something one or the other usually means walking a very fine line. Unlike with “real malware” (with which I deal at FRISK nowadays) spyware and adware are in a grey area. Peter.Butler.DLcom wrote:1. The Download.com Installer does not include any spyware or malware, nor do any of the offers included in the Download.com Installer. The Download.com Installer is optional and does not install anything to your computer, nor leave behind any components when deleted. I just tried to download WinDirStat of which I am the current maintainer and I couldn’t really find an option to get the download without your installer. The next release of WDS, for example, will be signed with my own Authenticode cert and therefore a wrapper rather disguises that information, don’t you think? Peter.Butler.DLcom wrote:3. The Download.com Installer is designed to make installing software easier for our users, and to grow our business so that we may continue to invest in new, more efficient means of distributing software around the world. Peter.Butler.DLcom wrote:Research and user feedback indicates that many people who download software don’t or can’t install it. From feedback of WDS users I concur. The problem, more often than not, seems to be PEBKAC. Peter.Butler.DLcom wrote:One consistent installer logo for all software from Download.com allows users to easily find and launch the software that they have downloaded. The Download.com logo and installer also demonstrate that the software has been fully tested and found secure. This actually does make sense to me, however, wouldn’t something along the lines of the Ubuntu software center just for Windows be a better choice? Because from what I see your installer doesn’t really solve a problem for adept users, only for those who are insecure. @B: the installers from CNET are signed. So they are kind of betting their reputation that the contained software is clean. I thought I’d contact them based on the posts on this site recently. Here’s what I received in return. Thanks for your feedback; we have shared your comments with the appropriate site managers. As you may already be aware, you do have a couple of options to download without using the CNET Download.com Installer – you can either click the Direct Download Link for Installer Enabled items, or, if you have a CNET account, completely disable the Installer for the whole site. while all your points are true enough and the hurdles HAVE gotten more numerous and devious, you do have an alternative. go buy the software you want for free. anyone who can’t successfully navigate their little minefield without stepping on one probably shouldn’t be installing software on their computers anyway. it’s really not that difficult, you just have to stop, and read. why buy, when the original is already freeware? >> anyone who can’t successfully navigate their little minefield without stepping on one probably shouldn’t be installing software on their computers anyway. The article linked to in the first paragraph of this article proves that “reading” & opting out of the mine field does NOT KEEP THE CRAP OFF YOUR COMPUTER. I agree with you both – people should read – like that article. Too bad the author of this article didn’t include more of a summary of Austin’s article, which might have prevented some of the condescending comments. I downloaded a program today from CNET, using their minefield/labyrinth installer. I successfully declined all additional offers and got my free program with no issues. Yet. 2. Get impatient that my install progress seemed slowed and aborted mid install. Both of these are things that Austin did that may or may not have created part of this. On the surface it seems impossible that if he declined Sweet Peas and aborted the install himself that any part of it should have taken place. However in a lot of these situations clicking back through a box or two can often reset the previous box to the default choice and you don’t notice this while clicking back and forth. So in his efforts to capture screenshots for his article, is it possible clicking from box to box caused the first box to change to a default setting he didn’t want? I think there is that slight possibility, simply because I used it today and had a different experience than he did. YMMV. So all I need to do now to complete the fix for this issue is to gather up the address of these nice folks and greet them first thing in the morning with a brick through their front window. Just kidding, of course, but whenever stuff like this happens I can dream…. I was wrong. My apologies. I think the uproar is more due to the nature of the can the garbage is coming from rather than the garbage itself. Most of us are experienced enough to navigate the minefield and smart enough to get why they do it. But this is the CBS network at heart. THAT’s my issue…they don’t NEED to, it’s a choice. Just as we have ours. Hi, I have removed everything I can as nec/ary what I do not need, but I am still having trouble trying to remove the delta browser, anybody know how… as it stuck like glue! CNET more than promotes extra software. I had three pieces of software installed on my system by CNET whilst getting a simple driver, without*EVER* (not once) clicking one thing aside from”DOWNLOAD” and clicking off one “opt out” for yet another tool bar. I am very careful with CNET (and everything too as SOFTPEDIA is no better). What I got was DEALPLY, MY PC BACKUP and the ASK toolbar *AGAIN!!!! * (I honestly did say no to the only choice I got, and the rest was all automated) – I was several fee from the keyboard, watching what appeared to be “ads” flit by in the installer (they were the other software it was installing). So, I saw a few very rapid things go across the CNET download manger window which looked like banner ads. It turns out they were telling me what extra software they were foisting on me. I never got to say “no” & there wer not any other links or buttons to click. It did it all automatically. Two clicks (clicking “download” and opting out of something) got me a zip files of drivers, and 3 extra pieces of software which were automatically installed on my PC . I tried lots of way to kill ASK. They did not work. Microsoft standard “uninstall” no longer works & neither does the ASK uninstall, or deleting the ASK “Program Files” directory, or removing the registry entries that have references to it. I read one site where SYS ADMIN swears that ask even changes the the system restore points on the PCs in his place of business, those that got infected where he works. As a result trying to restore form a stable point, brought back all the crap he spent the last 3 days getting rid of (like he had done nothing at all – and it was an OLD restore point too). I used several pieces of anti-malware software to try and get rid of it, and although each anti-malware software application “claimed” to have killed the “Ask toolbar” the only one that DID was MALWAREBYTES antimalware, which I had to get from a site other than that of the manufacturer because MALWAREBYTES hosts their official free download on the CNET store!They link to CNET! Proxmox rocks! I[m glad you mentioned it and hope you write about it and the Turnkey Linux containers,. kindly asking for installer to be removed and they answered with positive reply on the same day. It’s updated in 2014 which resulted in them putting the dreaded installer but now it’s gone. I told them I can’t put up their download button on my sites if there’s 3rd party software shipped which I have no control of. In above link, the “AntiVirus FREE 2014” link goes to download.cnet.com/… which is full of crapware. AVG promotes the use of CNET’s download.com so now, I have banned the use of AVG and instead will use Avast free anti-virus. Wait what? Where did you learn that Microsoft is financing CNet?